Welcome to Elm Street, the Ansonia Historic District, established by the City of Ansonia in an Ordinance which became effective on July 25, 1969. This street was originally called the Old Town Road and is truly the "cradle" of the Naugatuck Valley. In 1654, Edward Wooster came here from Milford looking for a place to grow hops for the Milford brewery and found that place along the banks of the Naugatuck River. He soon built a house in the area, and within a year other settlers joined him and also established families here. The first homes were most likely palisaded dwellings because the area still abounded with wolves bears and wildcats. There were also Indians here but they never became hostile to the settlers. In 1675 the area received the right to become a plantation and was named Derby after Derbyshire, England, the original home of some of the settlers. 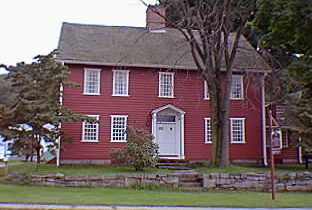 The original plantation covered a large tract of land, from Waterbury to Milford. Elm Street is now within the boundaries of the City of Ansonia, which became a town separate from Derby in 1893. Within the District, there are homes dating from the early 1700's through 1970, so that the area is a microcosm of architectural styles as they developed throughout the history of our country. All of these houses, with the exception of the General David Humphreys House, are privately owned. Continue along Elm Street to the Elm Street Green.